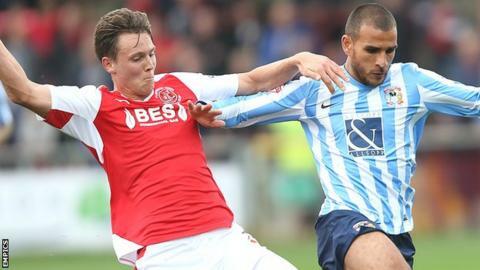 Eggert Jonsson's second-half equaliser edged Fleetwood a point clear of the League One relegation zone with a point at fellow strugglers Colchester United. After Fleetwood's Bobby Grant put a 25-yard curler just wide, the hosts went ahead as Alex Gilbey picked up a loose ball and drilled home a low shot. Jonsson scored his second goal of the season to equalise with a thunderbolt into the top corner. Fleetwood had a late chance to win it but Nick Haughton curled his shot wide. The hosts also went close but Fleetwood keeper Chris Maxwell denied George Moncur. Colchester remain in the relegation places in 22nd, still five points behind Fleetwood in 20th. Match ends, Colchester United 1, Fleetwood Town 1. Second Half ends, Colchester United 1, Fleetwood Town 1. Elliot Lee (Colchester United) is shown the yellow card for a bad foul. Corner, Colchester United. Conceded by Chris Maxwell. Attempt saved. Alex Gilbey (Colchester United) right footed shot from the right side of the box is saved in the top right corner. Nick Haughton (Fleetwood Town) wins a free kick in the defensive half. Attempt saved. George Moncur (Colchester United) left footed shot from outside the box is saved in the bottom left corner. Attempt missed. Nick Haughton (Fleetwood Town) right footed shot from the left side of the box is close, but misses to the right. Attempt blocked. Antoni Sarcevic (Fleetwood Town) left footed shot from the centre of the box is blocked. Attempt blocked. Nick Haughton (Fleetwood Town) left footed shot from the right side of the box is blocked. Corner, Colchester United. Conceded by Nathan Pond. Richard Brindley (Colchester United) wins a free kick in the defensive half. Substitution, Colchester United. Elliot Lee replaces Chris Porter. Corner, Colchester United. Conceded by Amari'i Bell. Substitution, Fleetwood Town. Nick Haughton replaces Jamie Proctor. Substitution, Colchester United. Macauley Bonne replaces Gavin Massey. Amari'i Bell (Fleetwood Town) wins a free kick on the right wing. Attempt missed. Drey Wright (Colchester United) left footed shot from outside the box is close, but misses to the right. Gavin Massey (Colchester United) wins a free kick in the defensive half. Substitution, Colchester United. Drey Wright replaces Marvin Sordell. Attempt missed. Antoni Sarcevic (Fleetwood Town) left footed shot from the left side of the box is too high. Attempt missed. George Moncur (Colchester United) left footed shot from outside the box is close, but misses to the left. Marvin Sordell (Colchester United) wins a free kick in the attacking half. Goal! Colchester United 1, Fleetwood Town 1. Eggert Jónsson (Fleetwood Town) right footed shot from the centre of the box to the top right corner. Substitution, Fleetwood Town. Jamille Matt replaces Ashley Hunter. Attempt saved. Conor McLaughlin (Fleetwood Town) right footed shot from outside the box is saved in the bottom left corner. Attempt missed. Antoni Sarcevic (Fleetwood Town) right footed shot from outside the box is too high. Attempt saved. Owen Garvan (Colchester United) right footed shot from outside the box is saved in the centre of the goal. Attempt missed. Alex Gilbey (Colchester United) right footed shot from outside the box misses to the left. Hand ball by Bobby Grant (Fleetwood Town).